Five Oaks by-the-Sea, the perfect Maritime seaside escape. Beautiful seaside ‘Lunenburg Bump’ house, just a few minutes from the Town of Mahone Bay. Five Oaks sleeps 10 comfortably so it’s perfect for family gatherings. The house is twenty five years young and built to replicate a traditional 1700’s Cape house with Lunenburg Bump. Most bedrooms have sweeping views of the Bay. A large deck, overlooking the water, makes outdoor conversation and meals a breeze. 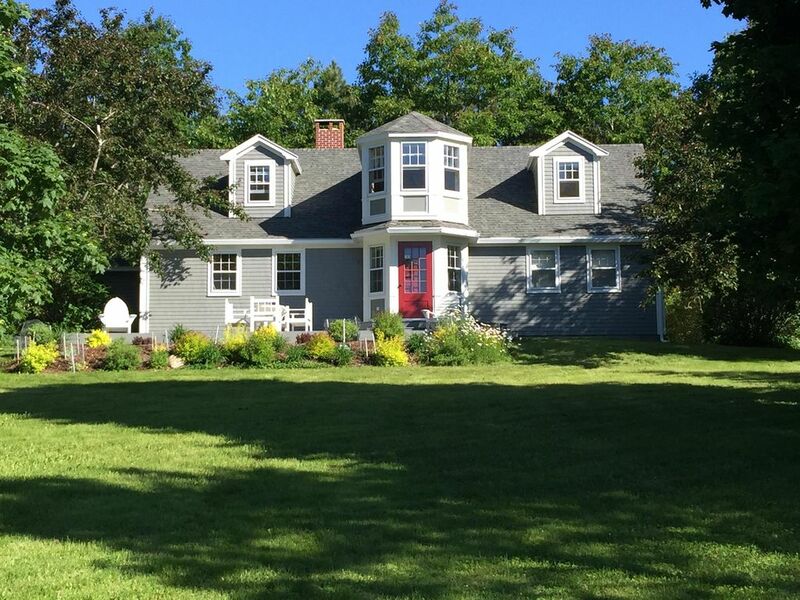 The property faces 300 feet of shoreline with views of majestic Mahone Bay. Walk along Hanson and Hirtles Coves on one of the area’s distinctive and peaceful cove roads. Children will love exploring the rocky shoreline at low tide. There are five bedrooms, two on the main floor and three on the second floor, including a two room linked family suite. A beautiful living room complete with fireplace looks out onto the Bay. A separate family room, also with a working fireplace, contains all the technology families need, including a large 42” flat screen TV and DVD player. A pretty Lunenburg Bump lookout sitting area on the second floor is the perfect place to read or talk over morning coffee. The home has beautiful pine wide board floors throughout. A newly renovated kitchen and dining room, complete with new appliances and all the comforts of home was completed in 2012. The house is Wi-Fi equipped. Outdoor dining is perfect on the house’s new front deck. There is also a new gas BBQ. Amenities also include two bathrooms (one three piece and one four piece). We’ve furnished Five Oaks with a combination of old and new – new beds and couches complemented by lovely antiques from the area. Egyptian cotton sheets and fluffy white towels make the place feel like home. Local stores carry wonderful local favourites like fishcakes and lobster rolls, blueberry scones and warm raspberry muffins. You can eat in or sample some of the many terrific restaurants in Mahone Bay, Lunenburg or Chester. All three towns are just a short drive away. Great local beaches include Hirtles, Crescent, Green Bay and Rissers. Drive your bicycles along the many curving roads that hug the sea! •	Have your morning coffee or late afternoon drink watching the passing boats while sitting on the fun fish shaped Adirondack chairs. Chairs and table also available for outdoor dining. My family has deep ancestoral roots in Mahone Bay. On my mother's side of the family, I can trace my ancestory back to two of the founding families in 1752. We live in Toronto where I am a management consultant. Going to Five Oaks is our perfect getaway. I love this area and fufilled a lifelong dream by buying this seaside home. It's a retreat for me and my family and I love that it has plenty of room for us to entertain guests as we love showing them the beauty of this wonderful area. I sail and love to explore the many coves and areas of Mahone Bay. Chester and Lunenburg are a few hours away by sail and we enjoy shorter day trips exploring the many ocean wonders. We've seen dolphins, seals and many birds and other marine life in the Bay, it's very special. Five Oaks by the Sea is a perfect house for families. It has lots of room for adults and kids with a living room for conversation and a family room for games, videos and other family pursuits. Five bedrooms allow people to spread out and two bathrooms make things easy. The ocean is endlessly interesting and walking, biking or running along the cove roads that hug the shore is something everyone loves. We are close to all that South Shore has to offer. Five Oaks is a few minutes from Mahone Bay, about fifteen minutes to Lunenburg and twenty minutes to Chester. All have great restaurants and shops full of local treasures. They are all important historical locations as well and are fun to spend time in. Chester Race week and the Pirate Festival in Mahone Bay are really fun. In Lunenburg have a great lunch or supper at the Magnolia Grill or Fisheries Museum. Fleur de Sel is a great place for an intimite dinner. In Mahone Bay we love Jo-Ann's Deli Market & Bake Shop, a local market with the most fantastic takeaway food and home baking including the best blueberry scones and warm raspberry or rhubarb muffins. Zwicker's Inlet Restaurant & Cafe is a great place for lunch with beautiful views of Mahone Bay's famous three churches. Try the Mug and Anchor for a pint of Keith's on the patio overlooking the harbour. In Chester, check out the Chester Playhouse, get a meal at the Kiwi Cafe or have a fabulous dinner at Nicki's Inn. As well, the area has many wonderful beaches like Hirtles (our favourite), Rissers and Green Bay. All are a short drive away. Another great trip is to drive to the Lehave River and take the car ferry across. It's a short trip and gives you unparalleled views of this great river. The Lehave Bakery is on the other side, which is worth a trip in itself! Egyptian cotton sheets and comfy duvets. Soft and fluffy white towels. No beach towels, please provide your own. Antique quilts offer comfort and a traditional touch in every room. 42 inch HD TV for watching DVD's or connecting to Netflix with your lap top computer.